At the Berger SW Nationals this week in Phoenix, the nation’s top long-range shooters will try to put all their shots in the 10-Ring at 800, 900, and 1000 yards. A good foundation in ballistics is vital if you want to succeed in the long-range game. How much do you know about BCs, Bullet Shapes, Trajectories, Wind Drift, and other things in the realm of External Ballistics? You can test your knowledge of basic Ballistics principles with this interactive quiz. The questions and answers were provided by Ballistics Guru Bryan Litz of Applied Ballistics LLC. Bryan is the author of Applied Ballistics for Long-Range Shooting and other popular resources in print, DVD, and eBook format. Have fun with our Quiz. The Quiz contains ten (10) questions. When you complete all ten questions, you can see your results, along with the correct answers. 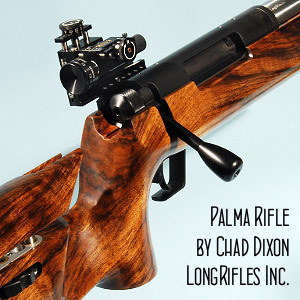 Share the post "Ballistics Brain Power — Take Our Ballistics Quiz"
Share the post "Palma Pride — Stunning Turkish Walnut-Stocked Match Rifle"
In 2009 Alliant unveiled Reloder 50, a new powder designed for long-range, 50-caliber rifle shooters. 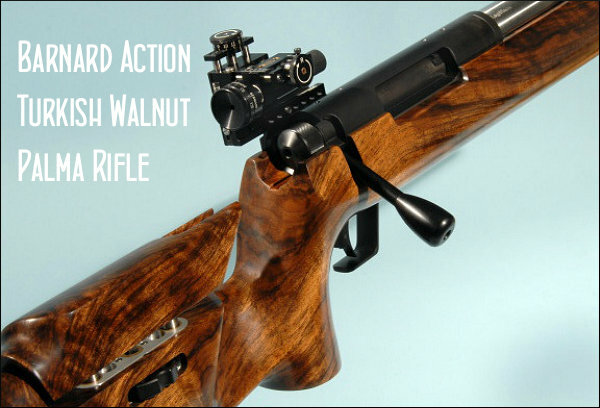 According to Alliant, the burn rate is “a little slower than Winchester 860″ and the powder is showing excellent lot-to-lot consistency. Load density is optimized for the 50 BMG and similar cases. Like Reloder 17, Reloder 50 employs a process which penetrates the kernels with the burn-rate-controlling chemical. This should allow a longer, flatter pressure curve, yielding more velocity than conventional powders can deliver. Alliant says that Reloder 50 offers “superior velocity and the ability to burn cleaner (with less residue).” Reloder 50 comes in both 1-lb (#150527) and 8-lb (#150528) containers. Giraud Tool makes a comparator for 50-Cal cartridges. The double-ended comparator is quite versatile. In one orientation you can measure base-to-ogive bullet length and also measure cartridge OAL from rim to bullet ogive. When reversed, you can use the comparator to measure cartridge headspace. The $30.00 Giraud 50 BMG Comparator gauge is constructed of 303 stainless and fits most any vernier, dial, or digital caliper. CLICK HERE for more info. 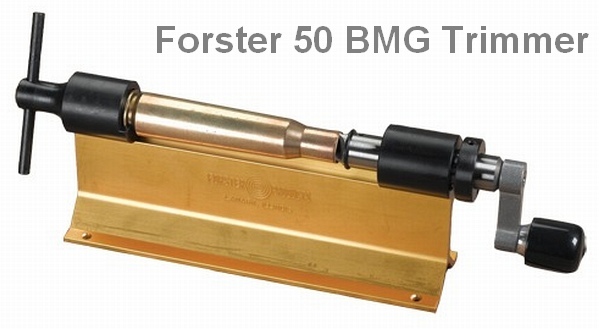 50 BMG enthusiasts asked for a dedicated 50 BMG case trimmer, so Forster created a trimmer specifically for that cartridge. Forster’s cutter tip is much sharper than the cutter on the Lyman 50 Cal. AccuTrimmer. However, with the Forster tool you will pay more for that superior cutting ability — Forster’s 50 BMG trimmer costs $95.99 at Sinclair International. Yes, Lyman also makes a dedicated 50 BMG Case trimmer ($66.49 at MidwayUSA), but the Forster cutter head is much sharper, and we prefer the Forsters collet-style case-holder. Bottom line — the Forster gets the job done more quickly, with less effort, so it’s worth the extra money. 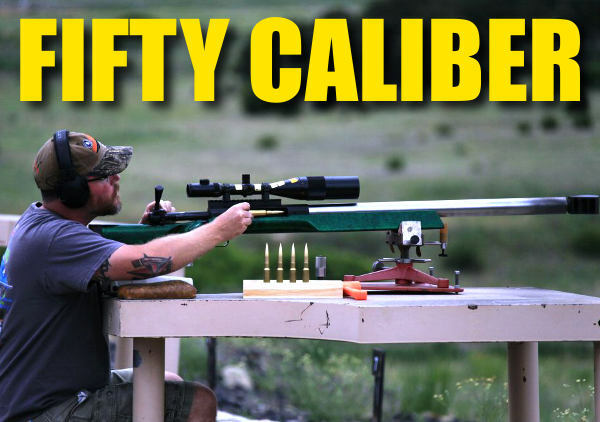 Share the post "Nifties for Fifties — Cool Stuff for the .50 BMG"